This article is about the rugby union variant. For the rugby league variant, see Rugby league sevens. "7-a-side" redirects here. For the variant of association football, see 7-a-side football. 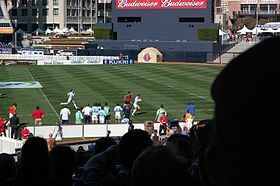 Rugby sevens (commonly known as simply sevens), and originally known as seven-a-side rugby, is a variant of rugby union in which teams are made up of seven players playing seven minute halves, instead of the usual 15 players playing 40 minute halves. Rugby sevens is administered by World Rugby, the body responsible for rugby union worldwide. The game is popular at all levels, with amateur and club tournaments generally held in the summer months. Sevens is one of the most well distributed forms of rugby, and is popular in parts of Africa, Asia, Europe, and the Americas, and especially in the South Pacific. Rugby sevens originated in Melrose, Scotland in the 1880s; the Melrose Sevens tournament is still played annually. 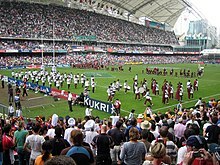 The popularity of rugby sevens increased further with the development of the Hong Kong Sevens in the 1970s and was later followed by the inclusion of the sport into the Commonwealth Games for the first time in 1998 and the establishment of the annual World Rugby Sevens Series in 1999 and the World Rugby Women's Sevens Series in 2012. In 2016, rugby sevens was contested in the Summer Olympics for the first time. It has also been played in regional events such as the Pan American Games and the Asian Games, and in 2018 a women's tournament was played for the first time at the Commonwealth Games. Sevens is played on a standard rugby union playing field. The field measures up to 100 metres (330 ft) long and 70 metres (230 ft) wide. On each goal line are H-shaped goal posts. The goal posts are on the goal line. This is unlike American football in which the posts are behind the back of the goal line. Teams are composed of seven players — three forwards and four backs. Scrums are made up of three players from each team. The chart below shows a team's typical formation at scrum time, with three forwards bound into the scrum, a scrum-half waiting to retrieve the ball once it exits the scrum, and three backs positioned to receive a pass. In open play, a typical defensive formation involves a line of six defenders, with one sweeper behind the line. With the attacking team using all seven players against the defending team's six in the line, the attacking team often attempts to move the ball to create an overload. The defensive line can be put under pressure if the defending team makes a tackle and commits players to the ruck; with fewer players in the defending line, it leaves more space for the attacking team to exploit. Rugby sevens tends to be played at a faster pace than rugby fifteens. Because of the faster nature of the game, sevens players are often backs or loose forwards in fifteens rugby. The differences are most notable on game restarts. Because scrums in sevens involve three players forming one row instead of eight players forming three rows, scrums tend to assemble more quickly, require fewer restarts, and the ball exits the scrum more quickly. Penalties in sevens are generally taken with a quick tap, instead of a kick for touch and a line out, resulting in the ball being put back in play more quickly. When a player is tackled and a ruck is formed, the ball tends to exit the ruck more quickly, as the attacking team generally has only three players involved in the ruck — the tackled player, one support player, and one scrum-half. 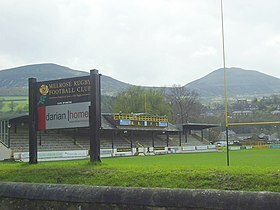 The Greenyards at Melrose in Scotland, beneath the Eildon Hills, is the original home of rugby sevens. Despite sevens' popularity in the Borders, it did not catch on elsewhere until the 1920s and 1930s. The first international tournament outside Scotland was held in 1921 in north east England at the Percy Park RFC Sevens in North Shields. Because it was near to the Scottish Borders, it attracted interest from the code's birthplace, and the final was contested between Selkirk (who won) and Melrose (who were runners up). The same year, the Buenos Aires Football Club hosted a rugby sevens tournament in Argentina. Due to the success of the format, the Hong Kong Sevens tournament was launched in 1976. The Scottish connection continued in the establishment of the Hong Kong Sevens in the 1970s, founded largely by expats such as "Tokkie" Smith, and in England, London Scottish RFC was strongly involved in the Middlesex Sevens from the start. The Hong Kong Sevens were ahead of their time and an influential force in the modernisation of rugby union. For example, the Hong Kong Sevens were one of the first rugby union tournaments to attract major sponsorship when the airline Cathay Pacific sponsored the 1976 tournament. They also provided a level of cosmopolitan international competition, which tended not to exist in rugby before the first Rugby World Cup in 1987, especially since Hong Kong was not seen as one of the "Big Eight". By 1986, the Hong Kong Sevens were held up as a positive example to others, although many of the smaller nations' teams were largely made up of expatriates. Rugby sevens continues to be popular in the Scottish Borders, where the ten most prestigious tournaments make up a league competition known as the "Radio Borders Kings of the Sevens". In honour of the role of Melrose RFC in the creation of rugby sevens, the club was inducted, along with Haig, to the IRB Hall of Fame in 2008. Sevens has also taken strong root in the Pacific island nations of Fiji, Tonga, and Samoa, as well as in Kenya. In many minor rugby nations, such as in Poland, development has tended to concentrate on rugby sevens as a means of introducing the sport to people. Rugby sevens has become popular in places such as Hong Kong, Singapore and Dubai, which are not so successful in the fifteen-a-side code. In addition, seven of the 15 current "core teams" that compete in all legs of the World Series represent nations that are not within the recognised top tier of the 15-man game — Fiji, Samoa, Kenya, the United States, Canada, Portugal, and Japan. Recently there has been the introduction of many new teams to the sevens circuit such as Ireland, Russia, and Germany. New Zealand has been the dominant force in the Sevens Series, winning 12 out of the 18 seasons, including the first six seasons from 1999–2000 to 2004–05. In recent years, however, several other teams have challenged New Zealand's dominance. Fiji won the Series in 2005–06 and again in 2014–15 and 2015–16; South Africa won in 2008–09 and 2016–17; and Samoa claimed the 2009–10 crown. Other strong contenders include England and Australia, each of whom have had several top four finishes in recent seasons. The 2015 London Sevens, saw the United States win their first-ever tournament in the World Series. New Zealand have been the most dominant team in the series since its establishment by winning four of the six competitions held up to and including 2018. Two issues related to differences between the structures of rugby union and the Olympics were sorted out before the 2016 Olympic Games. The issue of a combined British team has proven less of a problem in rugby union. World Rugby chief executive Mike Miller endorsed the concept of a combined British sevens team in 2011 for the 2016 Olympics and beyond. Another issue is the status of Northern Ireland. World Rugby recognises the Irish Rugby Football Union as the sport's governing body for the entire island of Ireland. By contrast, the International Olympic Committee recognises the British Olympic Association as the governing body of the UK Olympic team, while the Olympic Council of Ireland usually fields teams representing all of Ireland in sports which are organised on an all-Ireland basis. Northern Irish sevens players play for the Irish team. In the men's competition Fiji won the gold medal in the sport's Olympic debut, with Great Britain taking the silver and South Africa the bronze. The women's gold medal was won by Australia, with New Zealand taking silver and Canada bronze. The Rugby World Cup Sevens is held every four years and is the premier international rugby sevens tournament outside of the Olympic Games. The first tournament was held at Murrayfield in 1993 with England becoming the first team to win the event. Fiji and New Zealand are the most successful, having each won two out of the six World Cups. In the men’s competition teams compete for the Melrose Cup and in the women’s competition, launched in 2009, teams compete for the Women’s Rugby World Cup Sevens Trophy. Beginning with the 2018 edition, which was held in San Francisco, United States, the World Cup Sevens is held in the middle of the Summer Olympic cycle, two years after each Olympics. In Europe, Portugal dominated in sevens during the Championship era (2002–10); only twice the team did not win the trophy, in 2007 and 2009, when both times the championships were won by Russia. In the Grand Prix Series era from 2011 to the present, the champions became England and France; both teams won the trophy twice in a row. Portugal won the first edition, while Russia is the current champion. “ [Sevens] is in danger of becoming a totally separate game. Ben Ryan, who coached both the England Sevens and the Fiji Sevens, dismisses the idea that it should be seen mainly as a development tool. A few years ago players would spend a year or two with the Sevens squad to improve their running and passing skills. Many international players refined their game on the Sevens circuit including all-time greats such as Jonah Lomu. ^ "2006–07 IRB Sevens World Series Media Guide" (PDF). International Rugby Board. Archived from the original (PDF) on 3 July 2007. Retrieved 10 February 2007. ^ "Rugby 7s rules - Rugby rules for dummies". 8 September 2011. ^ Jones, The Encyclopedia of Rugby Union Football (1976), p. 122. ^ "Intro EN" (PDF). Archived from the original (PDF) on 16 November 2009. Retrieved 6 February 2010. ^ "Intro EN" (PDF). Archived from the original (PDF) on 19 December 2011. Retrieved 6 February 2010. ^ "Seven-a-side Variations: Standard Set of Variations Appropriate to the Seven-a-side Game" (PDF). International Rugby Board. Archived from the original (PDF) on 15 June 2007. Retrieved 10 February 2007. ^ "Laws of the Game: Seven-a-side Variations:". World Rugby. Retrieved 4 June 2016. ^ “Rugby Sevens: What to Know About This International Sport”, A Healthier Michigan, Katrina Danko, August 4, 2016. ^ “10 Principles of Playing Good 7’s”, Rugby Thoughts, Billy Millard, Accessed October 17, 2016. ^ "Set up your rugby sevens defence", Rugby Coach Weekly, Dan Cottrell. ^ "Coaching rugby sevens", Marcus Blackburn, page 85, 2014. ^ “Can’t tell a scrum from a sin bin?”, Today.com, Lexi Dwyer, August 9, 2016. ^ “Comparing Rugby Sevens with 15-Man Rugby”, Bleacher Report, Daniel Rey, May 15, 2015. ^ “Rugby penalties in Sevens”, Rugby Coach Weekly, Dan Cottrell, Accessed October 17, 2018. ^ "Situational coupling at the ruck", J.F. Barkell, 2017. ^ "Kenneth Carmichael Fyfe". ESPN scrum. ^ "William Edward Norman Davis". ESPN scrum. ^ "Radio Borders - All The Biggest Hits". Radio Borders. ^ "IRB Hall of Fame Welcomes Five Inductees" (Press release). International Rugby Board. 23 November 2008. Retrieved 8 October 2015. ^ "Dates set for 2010/11 IRB Sevens World Series" (Press release). International Rugby Board. 1 June 2010. Archived from the original on 4 June 2010. Retrieved 2 June 2010. ^ Hamilton, Tom (17 May 2015). "USA make history at Twickenham with first World Rugby Series tournament win". ESPN (US). Retrieved 17 May 2015. ^ "International Board backs British Olympic sevens team". BBC Sport. 6 April 2011. Retrieved 7 April 2011. ^ Gavin, Mairs (30 September 2009). "Great Britain will enter team if Rugby Sevens gets 2016 Olympic green light". Daily Telegraph. ^ Staff (22 October 2010). "Ireland finally look to take Sevens seriously ahead of Rio 2016". Sportsbeat. Archived from the original on 27 July 2011. ^ "Rio 2016 : 7 Rugby Men". International Olympic Committee. Retrieved 12 March 2017. ^ "Rugby, racquetball added to 2011 Pan Am Games". ESPN.com. 11 July 2007. ^ "Pan Am Games Tickets: Be Here for Gold-Medal History". TO2015. 18 August 2014. Archived from the original on 29 October 2014. Retrieved 28 October 2014. ^ "First IRB Women's Sevens event announced" (Press release). International Rugby Board. 14 September 2011. Retrieved 30 October 2011. ^ "IRB announces Women's Sevens World Series" (Press release). International Rugby Board. 4 October 2012. Archived from the original on 19 October 2014. Retrieved 4 October 2012. ^ Taylor, John (29 September 2010). "Fears for sevens specialists". ESPN Scrum. Retrieved 11 October 2010.